1. I seek the Lord’s wisdom in choosing the best one for the presidential post. Seeking wisdom from God is needed; only God knows the future and only He can guide us to make the best choice that honors Him. 2. I am and will be a good citizen no matter who is the president. I don't wait for strong with an iron fist president before I will become a good citizen. Genuine change begins in me. Before there can be a change in the country, there has to be change within. Why don't we start disposing our trash properly? 3. I don’t believe everything the media is feeding me. The media is not neutral and they don't observe the principle of impartiality. Not only that, people are creating black propaganda to malign and damage other candidates. 4. I will not bash and slander other presidential candidates; I campaign for my bet. We don't have to destroy others to lift up the candidates we support. Bashing people who have different opinion from you is not a good example, Rather than destroying other aspirants, why don't you just focus campaigning for your bet? Thinking you can convince those who are already convinced others to join you is pointless. Destroying their bet makes you their enemies. I advice people to focus on campaigning for their candidates. The problem is, may of of my friends FB wall contains post on the candidates they are against with. I have not really campaign for anybody. The video I uploaded few days ago concerning the Candidacy of Mayor Duterte is not for campaign perse. I found the movie funny and I am sure my friends would enjoy it so I shortened the movie and uploaded on Facebook. I didn't expect, it would become viral. Although, the movie's content is really to campaign for Duterte, the reason I uploaded was not to campaign but to share what the Igorot friends made. If you scroll down on my wall, there are no other post I've made introducing or campaigning for anybody. I admit I have my own preference, but I have not publicly endorse nor campaign for my bet because I know how divisive politics is. We don't have to agree who among the presidential candidates is the best for our country, but we don't have to become enemies. 5. I will support and vote, not who I think is the best for me, but I will vote for the one I believe is the best for my country. Some people are voting for a certain candidate for the benefit they can get before or after election. Some sell their vote. They are simply voting for what they can get now or later. I will vote for the future. 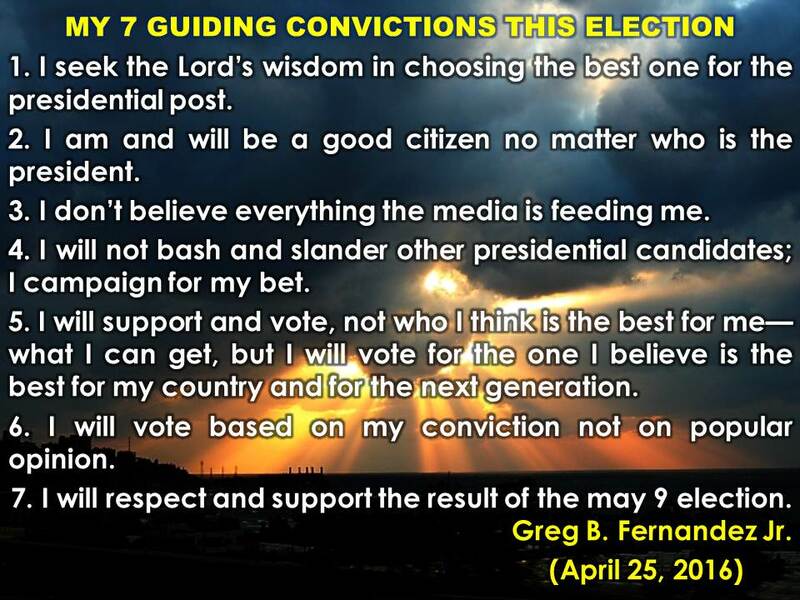 I believe the person I am voting for is the best candidates to fix the rotten system of the Philippine government. 6. I will vote based on my conviction not on popular opinion. I am not voting based on the majority of opinion but based on my conviction. It is easy just to jump into bandwagon without a personal stand and conviction. Don't vote for someone just because everyone else is, but vote for the one you believe who can make a difference. 7. I will respect and support the result of the may 9 election. 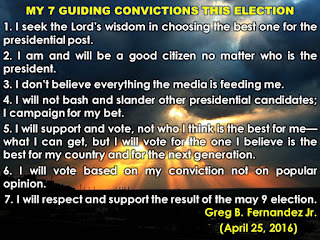 I will respect and support whoever is honestly elected and voted by the majority of the Filipino people, with the hope that no cheating on the election is carried out.